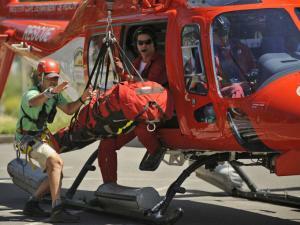 A TOP international base jumper has badly injured his leg in a crash-landing after jumping off Table Mountain today. Jeb Corliss is revered by many as one of the world’s foremost base jumpers and wingsuit pilots, and successfully “flew” off Table Mountain last week. Base jumping involves using a parachute to jump from fixed objects such as bridges, antennas, and cliffs. Corliss, 35, was airlifted from the mountain by an Air Mercy Services helicopter and taken by ambulance to Christiaan Barnard Memorial Hospital. The Californian’s friend, Joby Ogwyn, had already jumped when Corliss made his attempt. A shaken Ogwyn said he could not explain what had caused the accident. “It could have been a strange gust of wind; it could be that he got too close to the mountain,” Ogwyn said. “I’m not sure what happened. I heard a sound – it sounded like Jeb hit a ledge, it sounded like he hit it twice, pretty hard. “Apparently he’s speaking,” he said. Metro EMS said Corliss had jumped from the Africa Face ledge and crashed at India Venster. He had injured his lower leg and knee.